Robotics is a great way to get a little Engineering into your STEM program. You get a bonus portion of Technology as well. Kids love robots, it is a subject that captures both imagination and attention. There are many versions of robotics activities. With a little bit of creativity you can put together some activities that fit your age group and budget yet still teach important robotics principals and concepts. I recommend that you include coding as a part of your robotics efforts. Even if your robots are simple and don’t require programming you will want to make the connection in the students mind between building hardware and writing software. You can code “virtual robots”. Programs like Scratch are perfect for creating virtual robots. Elementary students are quite capable of learning programming. 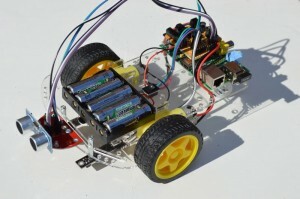 If you have the budget, there are a broad range of robot builds you can use based on an Arduino or a Raspberry Pi. What makes these great platforms is that they are open source, very well supported with resources and they provide a nice mix of electrical and mechanical engineering as well as programming. You can control how deep you go into each discipline with the project you choose. You can get a simple robot kit based on and Arduino Uno with a motor controller, 2 motors, distance sensors, battery pack and chassis for around $60. The software needed is free and there is already example code written which is also free. The Lego Mindstorm offering is also a popular choice although they are much more expensive and less flexible. Lego has it’s FIRST program with well organized activities for kids from 6 to 18 divided into 4 sub-programs. There high school (top 2) programs are excellent, especially their FIRST Robotics Competition. They don’t use Mindstorms but much larger and more “industrial” robotics components. The middle school program is based on Mindstorm system. The elementary school program just uses Legos and does not include any programming. There are many options. Start exposing your students to some engineering and programming. Build and program a robot with your students. We can help with programs and kits.